Naturally, only the wealthiest in the community can afford to compete for it. The sums vary according to the affluence of the community, and in some cases, the privilege is sold for well over half a million dollars. G-d orders Jonah to tell the people of Nineveh, who became very mean to one another, to correct the relationships among them if they wanted to survive. However, Jonah bailed out of his mission and took to the sea in an effort to escape G-d’s command. In the story, Jonah’s escape from his mission by ship caused the sea to roar and nearly sank the vessel. At the height of the storm, Jonah went to sleep, detaching himself from the turmoil and leaving the sailors to fend for themselves. Gradually, they began to suspect that someone among them was the cause of the storm. They cast a lot and discovered that it was Jonah, the only Jew on board. Like Jonah, we are sound asleep. Though we are beginning to wake up to the existence of hatred towards us, we have yet to realize that not carrying out our mission, just like Jonah, is the reason for the hatred. If we do not wake up soon, the sailors will throw us overboard, as they did with Jonah. In the words of Rav Yehuda Ashlag, author of the Sulam (Ladder) commentary on The Book of Zohar: “It is incumbent upon the Israeli nation to qualify itself and the rest of the people in the world… to evolve into assuming this sublime work of “love of others” (“The Arvut” [Mutual Guarantee]). The sailors on Jonah’s boat make a desperate attempt to calm the sea, and by Jonah’s order, they throw him overboard. Once he is in the water, the storm calms, but a whale comes along and swallows Jonah. For three days and three nights he introspects in its abdomen. He begs for his life and promises to carry out his mission. Like Jonah, each of us carries within, something that is stirring up the world. We, the people of Israel, carry a method for achieving peace through connection. Unity is the very root of our being. This DNA is what makes us a people, and today we must rekindle it because wherever we go, this untapped power is destabilizing the world around us in order to compel us to unite. We must reach an absolute connection between us, and we are now beginning to feel that this is being realized through our shared actions. The first true connection between us will give us a feeling of the upper world. This connection will be called the ten Sefirot of the Kli, and the mutual shared feeling that fills us will be called Light. The first Partzuf will be created within us, consisting of the Sefirot of Keter, Hochma, Bina, Zeir Anpin, and Malchut with the Lights of NRNHY in which we begin to feel the higher, eternal, complete, and true state. We will then understand that the present state we now exist in is like a dream that is given to us so that we will be pushed, and in thrusting ourselves away from it, we will be awakened and begin to work in a practical manner. To attain this, we must carry out a multitude of activities. But for the purpose of the appearance of a yearning for connection between us, our single group of ten or even a group composed of many groups of ten, is not enough. If we want our spiritual needs to develop constantly so that we will be obligated to yearn for each other and the Creator, we must feed our desires all the time. They do not appear within us by themselves; in order for them to appear, we must go out to the wider strata of the shattered Kli, meaning to all of humanity, to try and find additional desires among them. We must attract them to us, and in this manner we cultivate within us a yearning for coming together and elevation. It is forbidden for us to forget about this, otherwise we will wither away. People who don’t find themselves in dissemination outside of their group withhold an incentive and drive towards elevation from themselves. They will begin to sit instead until they lose the general common drive, and the group will be disbanded. So in the movement from me to we, we must remember wider dissemination. This could be the wisdom of Kabbalah or the wisdom of connection (Integral Education and Knowledge). It is not important what we call it; the main thing is that this is a wisdom about the right connection and unity, the restoration of the same collective Kli, the only desire that was shattered and destroyed from the start, even before the creation of our world. We know that the authors of The Book of Zohar, when they gathered together to write it in a state of unity, were always discovering such hatred within themselves that they were ready to burn each other. And these were great people in the attainment of the head of the world of Atzilut. In this exact manner the shattering of the Kli of the collective soul was discovered in them. But they had no other way to disseminate other than describing their attainments to help us with our correction, and in this was their correction. In this way, they departed from their ego and finished the work with absolute love. They then succeeded in describing great levels of elevation in The Book of Zohar. If we turn to other Kabbalistic sources, they all speak about one one thing: issues about connection and the laws and general rules of unity between people in our world, and after that, unity between the souls until the discovery of the only corrected state. A person faces many questions as to how to act, work, and speed up his development, that is, to speed up the revelation of the Creator. Revealing the Creator, the force that manages all of reality and our part in it, is the only thing a person does in this world. In order to achieve it, we follow the advice of people who have already been through this process and who attained the revelation of the Creator. This is the reason that we study the wisdom of Kabbalah, which by definition is the method of revealing the Creator to the created beings in this world. All we have to do is to fulfill and implement what Kabbalists say. Of course, the closer a Kabbalist is to our times, the more useful his advice is for us because he better understands us since he is lives the same lifestyle that and is as our contemporary. Thus, we begin to study the system that includes, not only the system of concealment between us and the Creator, but also the system where the Kabbalists are, those who have attained the Creator. They revealed the Creator during their lifetime in this world, which means that they removed the concealment. They are not in this world anymore, but the fruits of their work are not lost, and by using them, we can develop a special sense and recognition above our ordinary physical senses and mind. Our physical perception of the world is even more limited than that of animals. All animals can feel a tsunami approaching three days in advance and flee to the mountains. It is only humans who don’t suspect anything. We don’t even feel nature and are the furthest from it compared to all the animals. However, it isn’t about the existence of the corporeal body but about our attitude towards the upper force. The desire to attain the upper force awakens only in man and even that doesn’t happen in everyone. But in every generation since the existence of mankind there are people in whom such a need to reveal the Creator awakens and they fulfill this desire. Besides revealing the Creator they also leave us their writings though books, letters, and articles. Each one writes in his own style about how to remove the concealment, the system of concealments, and how to use the system. It is because it isn’t revealed all at once and not fully, but gradually. Thus we have to go through certain actions. Kabbalists tell us how to help each other do that if there are people in our generation with the same yearning for revealing the Creator. There have been many generations of Kabbalists since the first man (Adam), who was the first Kabbalist to attain the Creator and who removed the concealment. We can use their legacy, and besides their writings, we can also use their help. When we enter a system where the Creator is present, but invisible, we can use the help of Kabbalists who have already attained His revelation. They are actively incorporated within this system and sustain it on a certain level of revelation and attainment by bringing it closer to us and helping us become incorporated within it. We only need to attain the sensitivity and the recognition needed to reveal it so that we can use the system correctly with the help of the Kabbalists. We also have to carry out all their recommendations in this world. In our generation there are many people who want to reveal the Creator. We are living in a special time when there is permission to reveal the wisdom of Kabbalah to everyone. Anyone who wants to reveal the Creator can come and reveal Him. Thus we have a unique opportunity. If we unite in our search for the Creator, it will be like looking together for someone who is lost in the woods. We can all go out together, many people, and search the whole forest. Everyone can go and cry out: “Hey, where are you?? !” and so by helping one another, we will eventually find the one who is lost. Similarly, we can look for the Creator together. Such a collective search is much easier than searching individually. It is actually impossible to find the Creator by one’s self, but together we will do it quickly and easily. If you dig deeper in search of the perpetrators, the circle of suspects begins to narrow. Of course, it’s the Jews. Is there really a better candidate? For example, famous Greek composer Mikis Theodorakis is sure of this. Surveys, done in the USA have shown the same results. “I admire the spiritual steadfastness of the Jewish nation, its manly idealisms, its unconquerable faith in the victory of good over evil, in the possibility of happiness on earth. Is all this coincidence? Was the crisis an accident? 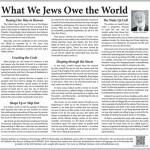 Are the Jews blamed for the crisis by chance? 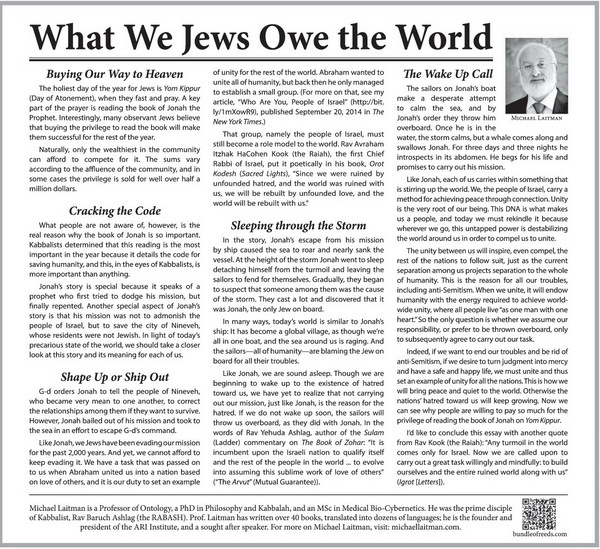 Are the laudatory remarks about Jews random? Maybe, a brick falls on someone’s head by accident? It could take a long time to prove that there are no coincidences, and it is a meaningless activity. Let’s focus for now on the compromise proposed by one of the greats. An accident is a non-understood regularity.